Find links to all our current chat areas at the top of most Webheads pages! We've been meeting every Sunday at this time since 1998! 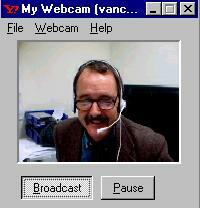 Since January, 2000 Webheads have been meeting in online VOICE chat, and we've been using video since October 2001. Sometimes we have Skypecasts Sunday noon GMT to 14:00, and at other times when announced. To find the Skypecast when we're there visit http://www.skypecast.com and find Webheads or EFLBridges or Worldbridges in the list of Skypecasts NOW. We tend to migrate to SL later than Sunday noon GMT and stay later than 14:00, and at other times when announced. To find out more check out our Second Life page here or at its mirror here. What do we do when we meet online? Since 2001 we've been meeting at Tapped In. We also experiment with numerous other places (see column at right) depending on what's hot and who's online. As your skills in chaos navigation improve, you can engage us in several places at once. Some of us try to talk in voice chat site at the same time as we write to each other in one of our text chat sites. We've also been playing around with web cams. It would be best if you try to visit our sites before noon on Sunday to see which are working for you. Meet at Tapped In, an online environment for students and educators. Start at http://www.tappedin.org and /join VanceS or go to /reception and find us there. The latter was blocked in UAE and China (early 2005) but was working by late 2005 but in late 2005 UAE newspapers report that Etisalat is looking into ways to block VOIP in the UAE. As of August 2006 it's still working in both the UAE and China, but by Sept 2006 the UAE authorities have finally managed to squelch it for home use. No one is quite sure what they are up to but users throughout the UAE are now reporting no access to the Skype client for VOIP. The papers reported that Internet City in Dubai was unintentionally included in the ban, which is the only 'official' mention I have seen regarding this policy in UAE. Having trouble getting the Java applets to launch? Check out our troubleshooting guide. Webheads are constantly experimental. In the summer of 2006 we were playing around with a number of Web 2.0 tools with are similar to Talking Communities / Alado and Eluminate / Learning Times. I am tracking developments here until I can think of a better way to present this information (and once we sort out which of these tools are truly useful: This process continues into late 2007 as we gear up for EVO 2008. Webhuddle, http://webhuddle.com/ has an on again off again server from our observations in July 2006. Dafne reports: "I have been trying WebHuddle, which is open source and you can download to your server: https://webhuddle.com/ While it is in Beta you can use it for free and keep your recordings on their server. You can play them or download them to your hard disk. Documents can be uploaded and it also has application sharing. " WiZiQ mentioned on the TALO list in Sept 23, 2007 Michael Coghlin said he "just gave Wiziq a quick test and it seems OK. Of course the true test is the reliability of the audio with someone else on line and I didn't do that. But I like the way it looks and ppt and whiteboard worked very smoothly". http://www.wiziq.com/ to sign on. "Free, web-based, nothing to download, Mac compatible," WiZiQ is being used in EVO Moderator Training 2007 and Becoming a Webhead 2008. See http://www.wiziq.com/virtual_classroom.aspx for a Virtual Classroom demo. This one works well: In May 2006 Yaodong and Venny met Geoff from /Australia and reported "He generously offers us a nice e-conferencing room with calendar to schedule international collaborative learning. It's at: http://www.inetconferenceroom.com/rooms.nsf/discovere05. Anyone can click the Conference room and enter an ID without password to enter the room. If you're a teacher and need moderator's authority, please feel free to write Venny. The chat room now has 10 seats. Please feel free to use it and jot down (book) the room on the schedule." During meeting times, many of us open more than one of our sites in separate browser windows. Alado voice-enabled presentation room - Andy Pinchon has been a Webhead since Global Learn Day VI in 2002 (he might have joined the group after that, but he became a Webhead on that day). He has been very supportive of Webheads activities and has arranged for us to use - and maintained for us - a voice enabled meeting room at http://www.alado.net/webheads. No registration necessary, relatively small plugin to download, maximum capacity ten simultaneous users, though Andy will arrange for larger capacity if needed. In January 2008, Andy reports: The new version is MAC enabled. The changes we've made include the Whiteboard feature, the recording in flash feature, MAC enable flash for Firefox brower only feature, and how to upload your powerpoints onto either our server or your own server using FTP. Learning Times/Elluminate: vClass voice-enabled meeting room- The Learning Times community have been very supportive of Webheads and have created a voice-enabled meeting room for us at: http://home.learningtimes.net/learningtimes?go=273662. I made a Tiny URL for it: http://tinyurl.com/y3eh. It is also available using the "Member Offices" link on the left side navigation of the http://www.LearningTimes.org community. We're the last listing, "Webheads - Virtual Office." Registration with Learning Times necessary prior to use, slightly long download on first use, works with Macintosh, 24/7 use for up to 8 simultaneous users and up to 25 with prior notice. Homestead text chat and Guest Book - The easiest chat for most people to reach used to be our Homestead chat room. However, now that we use Tapped In, we don't go there so often any more. You are however welcome to use the site at any time you wish. To go there, visit http://www.homestead.com/prosites-vstevens. There used to be a Guest Book there but I don't think it works any longer. ICQ - This is the first instant messenger many of us old timers were using to find each other online when Webheads started in the mid 1990's. You can find our ICQ addresses at http://www.homestead.com/vstevens/files/efi/students.htm. Vance's is 2774215. Here's a conversation I had with Felix in 2001. He'd found a site where you can go to access your ICQ. Vance 9/5/01 4:16 PM NOT! How? Vance 9/5/01 4:17 PM Cool. I will try that. Gotta run now. MSN Messenger from http://messenger.msn.com. Has voice and text chat, lets you know when buddies are online, and you can record chats by cutting and pasting from chat window. MSN Messenger used to also be a convenient way to start a one-on-one voice/video conference using Netmeeting, but since it became webcam enabled I haven't noticed this feature in its interface. MSN Messenger is one-on-one for voice and webcam. Yahoo messenger seems to be better as a free messenger. The good point for PalTalk is its groups (rooms). You can create a permanent group to form an online commnity. You can see some English learnign groups under Distance Learning and Premium Learning categories. There are also many other categories with lots of groups, like Palk Radio, Social issue, Friend categories. TAPPED IN - This is a MOO-like text chat area and community space where many webheads have offices. To find us, click on a Webhead's name (like vances), pull down your ACTION menu, and select JOIN. (You should then join that member; if not just ask anyone you find at Tapped In to help you). Click on anyone's name in the Online tab to join that person directly. The focus of Webheads in Action is on teacher professional development for teachers and teacher trainers and forming communities of practice with CMC tools. http://www.vancestevens.com/papers/evonline2002/webheads.htm Join Vance Stevens every Sunday in Reception at noon GMT (for two hours). mycorner.xsia.com - This site has rides. You have to download zip files and then double-click on them to get the images you need for the rides. Michael and Vance tried it and easily enjoyed the rides, and nothing bad happened to our computers. We particularly liked the Hang Glider ride. If you want to try, we'll show you how. There are many resources, including discussion lists, tools, and a Palace directory at: http://www.palacetools.com. There used to be Palace avatars at http://www.digimask.com. First, thing, are you behind a firewall? If so ask your network administrator what restrictions there are on chat. Or if you're doing this from a home computer, route yourself around any personal firewall or security programs you're running. If that doesn't work, run Windows updates: http://v4.windowsupdate.microsoft.com/en/default.asp. Get all the ones you're missing. The latest Direct X might be particularly important, so you might want to start with that. If that doesn't work come to Tapped In any Sunday noon GMT to about 14:00 and we'll try to help you live and online (Webheads, I guess you saw our web page). Delphi text forum http://forums.delphi.com/webheads/messages - This site has got so blatantly commercial we hardly use it anymore. In its heyday it used to allow voice chat using the robust HearMe client. There used to be a guest board here but it unexpectedly went belly up in 2003. For Tapped In Classic, we had screen shots of these instructions at http://www.vancestevens.com/findbuds.htm#tappedin. To turn a &recorder into a note use the command /unrec nameofrecorder. Since the recorder is already in the room, it is still visible to everyone and anyone can read it. If you don't want anyone to read it, type /get nameofnote. That will pick it up and put it in your items where only you can read it. Type /get year/month/day webheads to pick up the recorder to take it to your office. /mailme: you can use that command for any note you hold, any note that is dropped in a room, or any help file in TAPPED IN. Option A: get an emailer from supplies, drop it in your office, and put the transcripts in the emailer...then you can direct people to the emailer in your office. An emailer is what is used in the ASO for retrieving transcripts. The only problem with using an emailer is that only TAPPED IN members can retrieve the scripts. Option B: get a container from supplies (name it webheads transcripts) and put your webheads notes in the container. Anyone can still read the transcripts in a container. If you don't want anyone to read them, and want to put them somewhere, get a library from supplies...you can lock that container. If you want to bring your class to the SAC, you will need to get student accounts for them. A student account provides a private, safe and secure opportunity for the student to log in to the SAC. For more information about how to apply for the accounts and information about how the accounts work see http://www.tappedin.org/info/students/join.html. Please allow a week to 10 days for the accounts to be established. Your membership ID is your introduction to the community members. Help us build a sense of community by making sure you update your profile and description after you have registered in the new version of TAPPED IN (http://www.tappedin.org/new) To do this, click on the ME tab, go to Settings, and then Edit Description. What you enter in your description is what people will see when they ID you. A new feature has been added to TI2. You can add your photo and an icon. Currently, photos appear in your description and icons show when you click on the ME tab and go to People (Buddies). To add a photo or icon click on the ME tab and go to Settings. Under Edit Description you will see directions. The size limit for photos is 160 x 160 pixels and the size limit for icons is 40 x 40 pixels. Telcopoint was supposed to be a reincarnation of Hear Me, but free sites were never given enough bandwidth for them to work properly. At one time Wimba let Webheads trial their synchronous voice tool, Voice Direct. There are directions for Wimba voice chat logon here.